We’re Baaaack! New class series starts May 3rd! Ladies Styling Workshop May 13th! NEW CLASSES, NEW LOCATION, NEW FORMAT…OH MY!!! We’re baaaaaack and more excited than ever with a brand new location and format for classes. Thank you for your patience in allowing Fearless Leader to take a couple months off and recover from what turned out to be TRIPLE HERNIA surgery. The surgery ended up being a little more than we anticipated but Mario is healing nicely and is happy to get back up on his feet again. It gives us great pleasure to announce that FunDance’s new home for class will be Omni Salsa. Omni Salsa is conveniently located at on Richmond Ave just west of Chimney Rock. This is a great central location and not too far from where classes were held before. The studio has one room and is a different configuration. As such we have had to change the structure of our group classes. Make sure you scroll down and read all the details regarding Wednesday evenings as class times have changed. PLEASE bear with us as we try out this latest format. We are experimenting and would GREATLY appreciate any and all feedback you might have as to how we can improve our lesson delivery. It is our intent for you to finally have the opportunity to take class with friends and co-workers who are just getting started. FREE (ok…really heavily discounted) STUFF!!! BRAND NEW OFFER!!! – If you would like to attend more than one class each evening, we are offering and UNLIMITED PASS for Wednesday nights at $75 for ALL THREE CLASSES, or any combination of two classes. Please be mindful of your level, and do not attend classes above your ability. Instructor approval is not required, but GREATLY recommended. If you are unsure about your level, please speak directly to Mario or Stephanie. INTERMEDIATE – 6:30pm, BEGINNER – 7:30pm, ADVANCED – 8:30pm. Cost – $50 per person for the month of regular classes, or $20 per person for a single class. BRAND NEW OFFER – For the IRON MEN AND WOMEN who would like to attend all 3 classes, we offer the UNLIMITED PASS (a.k.a. heavy discounted rate of) $75 for ALL THREE CLASSES!!! Levels – INTERMEDIATE – 6:30pm, BEGINNER – 7:30pm, ADVANCED – 8:30pm. WHAT ABOUT THOSE PRIVATE LESSONS??? Yes, we are available for private lessons throughout the week. Daytime not an issue, and you actually have a better chance of booking immediately. Both Mario and Stephanie are available to teach private lessons. Please feel free to contact us for more information. Looking to improve your skills faster, and have a group? LADIES STYLING CLASS IS BACK!!! Full details below…come join us for a great afternoon of Ladies Styling…You can expect to learn both general styling as well as specific styling to different types of music for the most common patterns found within the dance…must be comfortable with WCS basics in order to attend the workshop. No partner is required (we are dancing by ourselves), but you do want to have strong knowledge of your basics. We will open the registration desk 30 minutes before class starts. SIGN ME UP!! – Should you wish to preregister you can do so at any of our regularly scheduled classes. Tell your friends and make sure you join us for this FUN Saturday!! PURE DANCE SAN ANTONIO BABY!!! I’m sure you’ve heard about the ABSOLUTELY AMAZING time everyone had at Pure Dance Houston. We are officially taking the party on the road to SAN ANTONIO for a weekend of partying with our friends at the ALAMO WEST COAST SWING CLUB!!! Details below...you don’t want to miss this…trust me…I’m told I had a great time at the last one…BRING IT ON BABY! Ready for a local dance event without competitions? Come join us for a weekend of 15 hours of fun social dancing and workshops with dance instructors you know and love! Two individual workshops will be held each hour at 7:00 pm and 8:00 pm. Two individual workshops will be held every hour from 10:00 am – 4:00 pm with a 15-minute break between each session. After the last workshop, the studio will close and reopen at 6:30 pm for a catered dinner from 7:00 pm – 8:00 pm. After dinner, join us for an “All Hands on Deck” workshop – a unique experience everyone will enjoy; all instructors will teach class from 8:00 pm – 9:00 pm. To register by credit card, please call 210 896 2352. Regular students may also pay in person before or after class. A limited number of tables (7, 8, and 9 seats) may also be reserved in advance. Please be sure to add the hashtag link to all your posts and pictures at the event! Mario Robau Jr. is the most decorated WCS instructor in Houston, period. With a competitive career spanning 3 decades, he has over 30 National Titles covering all styles of competition, having multiple wins at the national level in Classic, Showcase, Strictly Swing, and J&J. 2-Time US Open Classic Division Champion, US Open Team Division Choreographer and Champion, including Dallas Dance Hall of Fame, Living Legends Hall of Fame, and the youngest person ever inducted to the World Swing Dance Council Hall of Fame, he’s choreographed more US Open Championships (over 20) than anyone else. Since 1990, Mario has traveled full time professionally across North America, South America, Europe, and Australia in the Swing, Country, Ballroom, and Carolina Shag dance circuits. Most recently, Mario became the first instructor in WCS history to be hired to teach in all 50 states. No one else in Houston has these credentials. Stephanie McPherson-Robau is a 4 time UCWDC (United Country Western Dance Council) World Champion, twice in the Master’s Division (the highest level of competition offered in the UCWDC) and twice in Division 1. No one in Houston has won more titles in this field. She has coached and taken at least 10 of her Pro-Am students to earn their own UCWDC World Championship Titles at their respective levels. Classically trained in Ballroom and Latin, Stephanie has incredible knowledge of dance technique in ALL dances, not just WCS. FUNdance is all about real social dancing. We’re here to bring you quality instruction from top professionals in a non-competitive environment. If you have any suggestions on how we can better serve you or make our classes better and more accessible, please email Mario directly mario@fundancehouston.com. 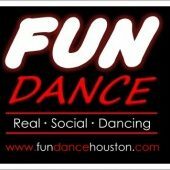 FUNDance Houston is all about teaching social dancing. Our goal is to provide a fun, relaxed yet professional atmosphere. Our group classes focus on leadable material that works with everyone, not just those attending the class with you.